The most beautiful? 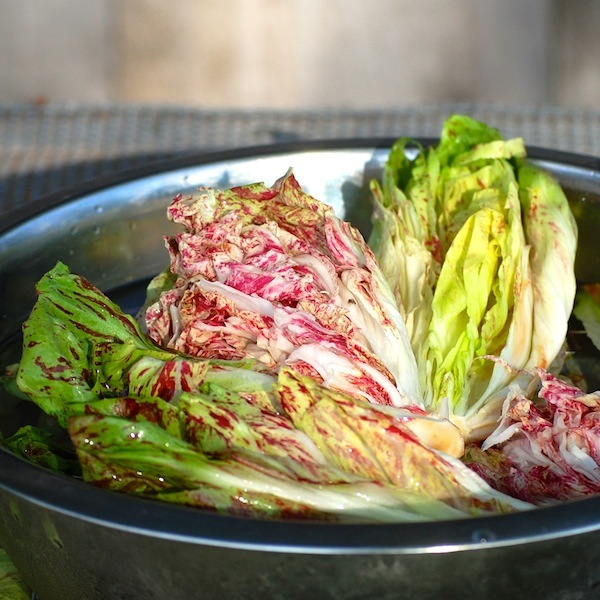 This Bel Fiore Radicchio. The most trendy? 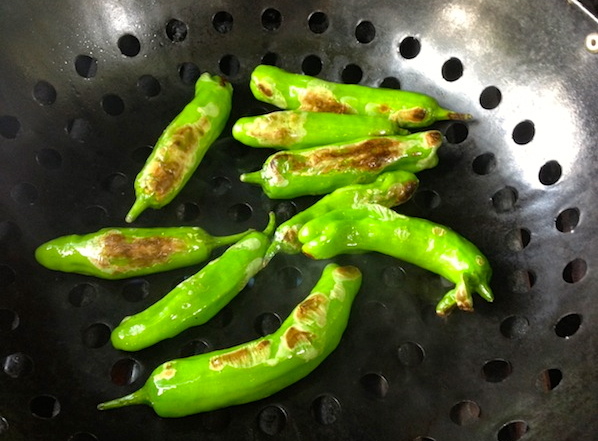 Shisito peppers. Well, oops, apparently (according to this hysterical mock restaurant menu on Eater.com) this trend is now passé in certain circles, or at least ubiquitous, which is never a good thing. 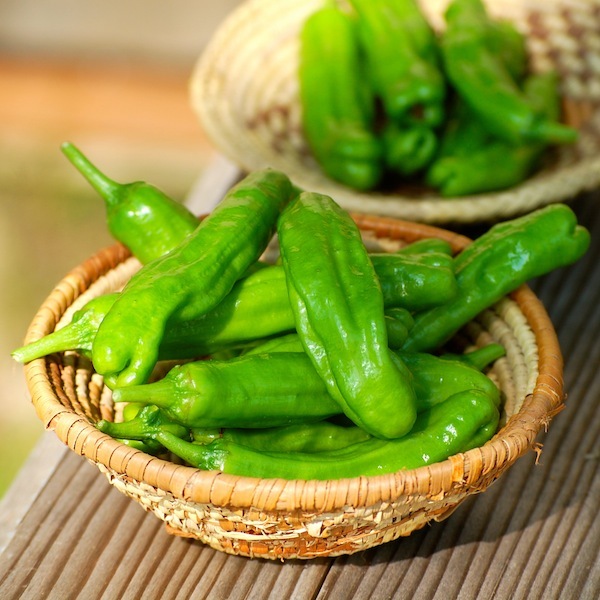 But for a market gardener, a cook, or an eater, Shisito peppers are a total win-win-win. 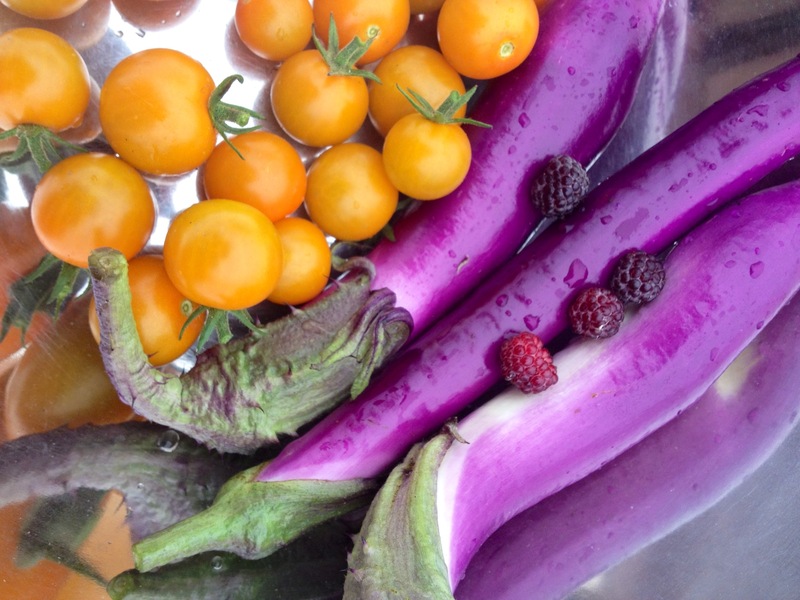 The plants are prolific, the cooking is super easy—just toss with oil, cook in a hot cast-iron pan or in a grill basket until blistered (a few minutes), and season with sea salt. Eat the whole thing—absolutely delicious. Summer-crowd appetizer friendly, too. And yet despite these less familiar vegetables, it’s something kind of classic (it’s a squash after all!) that seems to confound people the most. 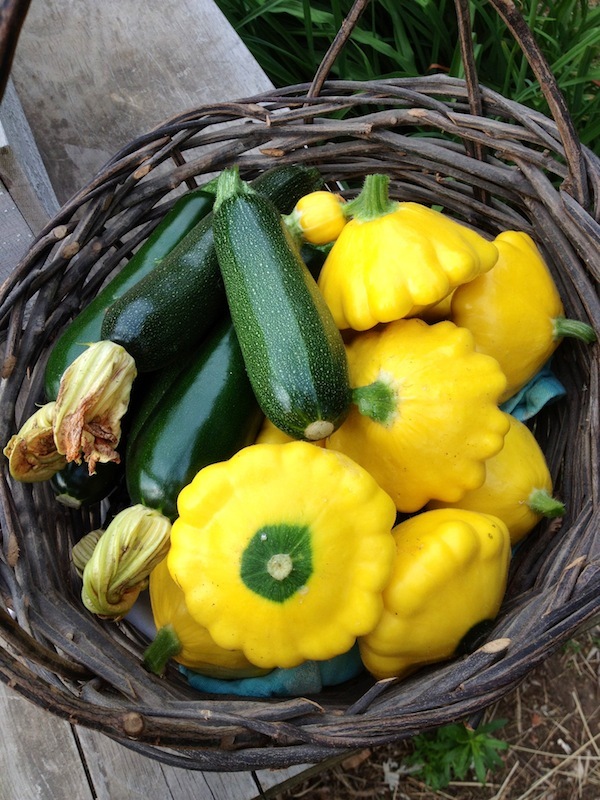 Every single day, I put all the green zucchini and the yellow pattypan squash in a big basket together. 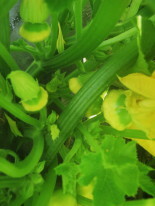 And every single day the zucchini quickly sell out before the pattypans. 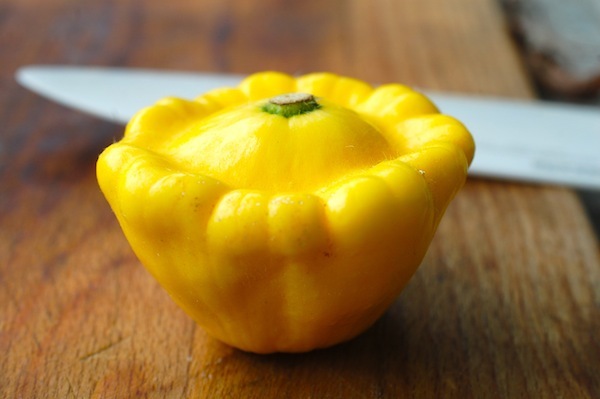 The pattypans do have their admirers—our Sunburst variety is so cheery—and there are some shoppers that exclaim, “Oh, my favorite!” and buy 5 or 6 at a time. But I finally realized it’s the shape that stumps many folks. Because in reality, the texture of a pattypan is no different than a zucchini (as long as neither is overgrown) and you can dice or slice or grate or chop them both. 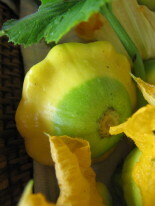 (The Sunburst pattypan, despite being yellow, does not have the seedy, watery texture of a crookneck or summer squash, but the firmer texture of a zucchini.) 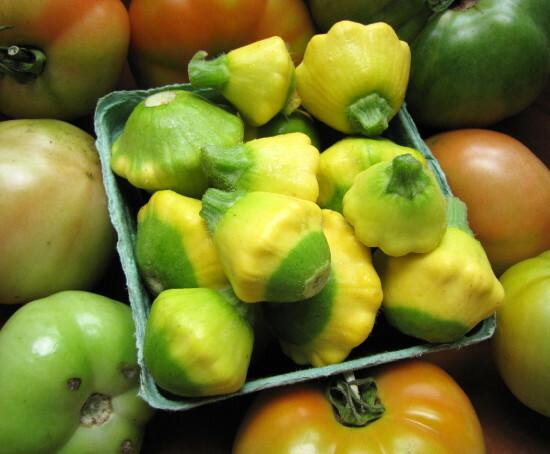 I think the flavor of a pattypan is actually a little sweeter than a zucchini. 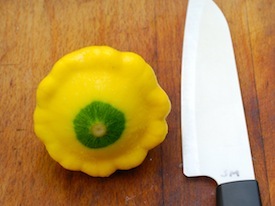 But when you look at a pattypan, especially a full-grown one, as opposed to the minis I’ve written about in the past (apparently my obsession with this subject has not waned), you do have to stop and think, now how am I going to cut this thing? Hence, my first suggestion: Slice it and roast it. Specifically, slice it North Pole to South Pole (not through the equator), with one of the Poles being the stem end. Slice it thinly, but not too thinly, brush or toss the pieces with oil and salt, and roast in a 425° degree oven until golden brown and tender, 18 to 20 minutes, turning over with tongs once if you like (see finished photo at top of blog). In the last few minutes, you can sprinkle with a mixture of bread crumbs, Parmigianno and parsley if you like (right). Serve as a sidedish with a squeeze of lemon. Or sandwich a bit of goat cheese between warm slices when they come out of the oven and drizzle with a black olive vinaigrette. 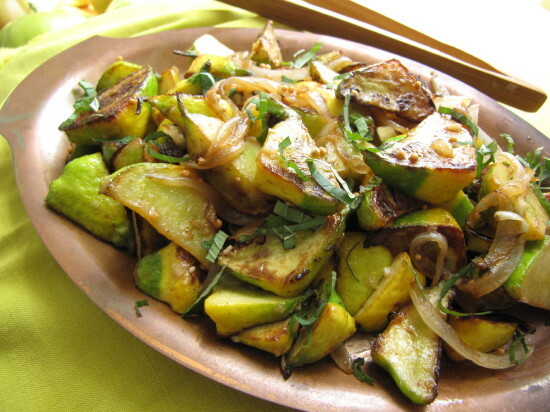 (There’s a recipe for Grilled Antipasto of Green and Yellow Zucchini with Black Olive-Lemon Vinaigrette in Fresh from the Farm. You can also grill, rather than roast, the slices (just cut them a little thicker). 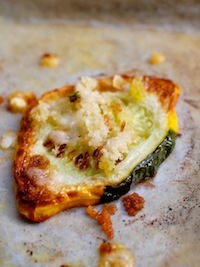 The slice shape also works just dandy in a vegetable gratin like this one—just replace the zucchini slices with the pattypans. 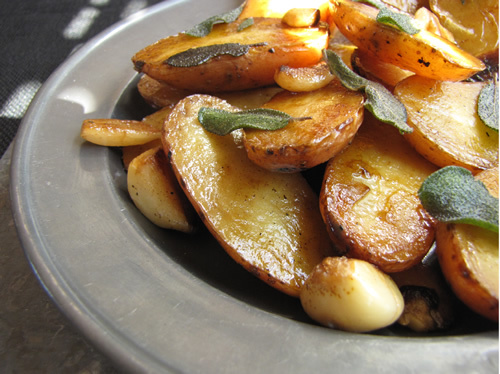 Now for those of you who’ve been asking about cooking those little Fingerling potatoes, I’ve got a treat for you. Click here! Because our Pattypans (actually a variety called Sunburst hybrid) are so prolific, we harvest them pretty small (between an inch and a half and two inches wide.) So when I’m ready to cook, I simply quarter them through the axis to get nice diamond-shaped wedges. 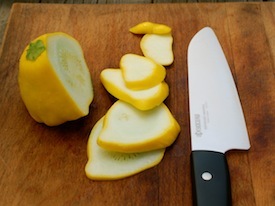 Or if the squash are a little bigger, I cut them into six or eight wedges instead of four. It’s like cutting a pie if you look from the top. I use my stir-fry pan to cook the wedges over medium-high heat until nicely browned and just tender. I think this how-to-cut-and-cook issue is probably what stops folks from buying the little Pattypans. 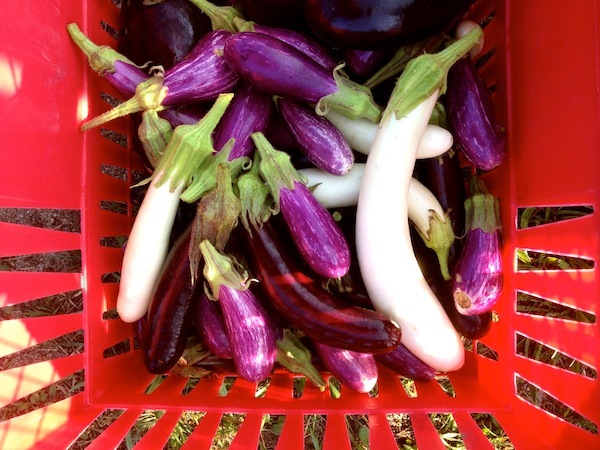 So I heisted some from the stand this morning, with the specific goal of making a recipe to pass along to both you and our farm stand visitors. 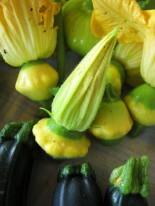 If you happen to be growing Pattypans or Sunbursts or any other scalloped squash, remember that large ones (4-inches across and bigger) are perfect for stuffing, too. 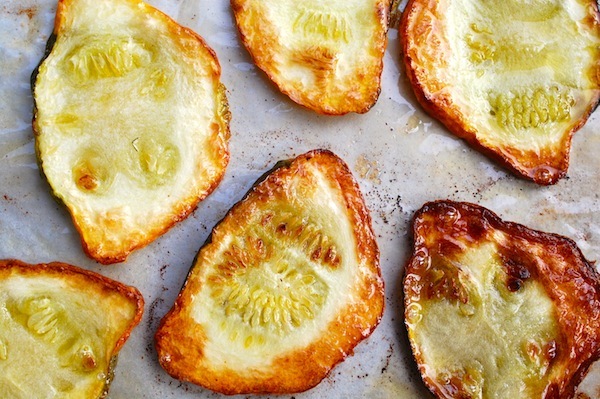 Also, cut into thick slices, they’re lovely grilled and topped with a bit of parmesan or fresh goat cheese. The slices also work well layered in a gratin. And don’t forget roasting—either the wedges or the slices will do well in the high heat of the oven. 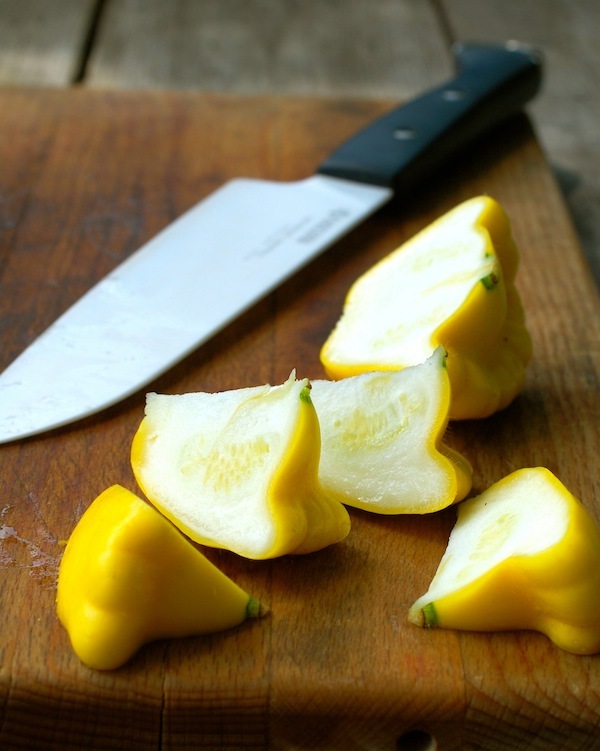 For summer vegetable soups, add the squash pieces at the very end of cooking so that they don’t lose their great texture. The mustard seeds, with their surprise pop-crunch in the mouth, are a fun addition to this stir-fry. But you can make it without them. I have a really fragrant peppermint growing in a big tub in my garden, so I use it freely. But if you don’t like mint, cilantro is your next best bet here. Or parsley would be just fine. 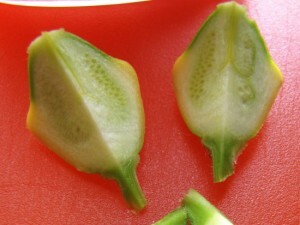 In a small bowl, combine the cumin, the coriander, and ¼ teaspoon kosher salt. In a large nonstick stir-fry pan (or 12-inch nonstick skillet), heat 1 teaspoon of the peanut oil over medium-high heat. When the oil is hot (it will shimmer), add the onion and a pinch of kosher salt, and cook, stirring, until the onion is charry around the edges (brown in patches but still a little firm), about 2 to 3 minutes. Transfer the onion to a plate. Add another teaspoon of peanut oil and the squash to the pan. Season the squash with another pinch of salt, and cook, stirring occasionally, until the squash is nicely browned on most sides, 6 to 8 minutes. (If the pan seems dry, add the third teaspoon of peanut oil.) Return the onions to the pan, add the garlic, the spice/salt mixture, and the mustard seeds (if using), and cook, stirring constantly, until the garlic and spices are incorporated and fragrant, about 1 minute. Remove the pan from the stove, sprinkle the lemon juice over it, add the butter, and stir well until the butter has melted. Transfer the vegetables to a serving plate and garnish with the mint.